If you purchased directly from us, please refer to these instructions. This article refers to purchasing and installing from Apple's Mac App Store. First, if you have been demoing Scrivener for a time, and have decided to purchase the software via the Mac App Store, you will first need to delete the copy you have installed. This is because the App Store software is smart enough to know you have a copy of Scrivener installed, but not smart enough to know that it is a demo. It won't let you install a purchased version so long as the demo is on your computer. You will need to drag the Scrivener icon from your Applications folder to the Trash icon in the Dock, and empty the trash before you can proceed (you may also need to restart your App Store software). Since your work is stored in files in your user folder, this is always safe to do. If you haven't demoed the software yet, we encourage you to follow the instructions in the first link above, prior to making your purchase decision. 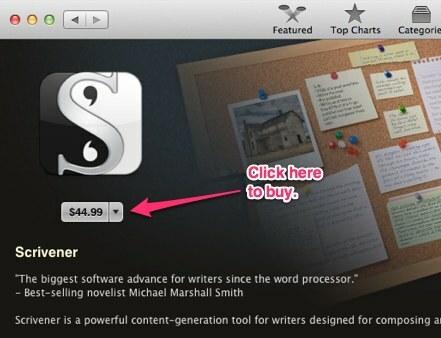 After confirming your purchase, the Scrivener icon will load in your Dock (on Snow Leopard) or in LaunchPad (on Lion). You will need to wait until the software completely downloads before you can run it from either location. There will be a progress bar beneath the icon while it is installing. Once the progress bar disappears, you can now click on the icon in LaunchPad or the Dock to load the program. That's it! Your copy is fully registered and activated on this one machine. Note that if you ever need to re-install the software for whatever reason, you may do so using the Purchases tab in the App Store software. Sometimes this will involve deleting the existing version from your Applications folder, first. If you are having difficulties getting the "INSTALL" button in the Purchases tab to light up, try emptying your Mac's trash can, logging out of your App Store account using the Store menu, restarting the App Store software, and then logging back in. If you want to install Scrivener on your other computers, you will need to use the Mac App Store software on those computers to do so. Simply click on the Purchases tab in the App Store interface to access your account, and click the "INSTALL" button next to the Scrivener icon in the list. If the other computers cannot run the App Store, then they will need to be updated to do so. If that is not possible (older hardware, for instance, cannot be upgraded to Snow Leopard), then you should consider purchasing the standard direct sale version from us, as it has support all the way back to Tiger and will run on PowerPC chips as well as newer machines. I lost my serial number, what can I do to get it back? Should I buy from your web store or from the Mac App Store?